For some people, anesthesia is one of the scariest parts of surgery. Do you wonder about the risks? An anesthesiologist responds to common questions about safety, particularly general anesthesia. For some people, anesthesia is one of the scariest parts of surgery. Do you wonder about the risks? We spoke with anesthesiologist Christopher Troianos, MD, to help separate fact from fiction. He highlights five key points about anesthesia that are sometimes misunderstood or have changed in recent years. There are three different types of anesthesia, and you’re only unconscious with one of them. 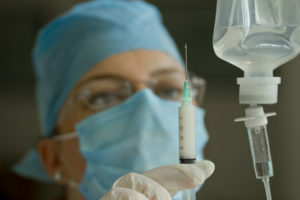 General anesthesia is what many people think of when they think of anesthesia. This puts you to sleep during surgery. It is typically used for surgeries in areas such as the abdomen, chest or brain. Doctors also may recommend general anesthesia if they expect a long or complex surgery. Local anesthesia involves numbing a specific part of the body to prevent pain during surgery or other procedures. It’s often used for dental work — the dentist numbs only the part of your mouth where you need a filling or extraction. Regional anesthesia blocks pain in a larger part of the body, such as an arm or leg, or below the waist. The most common example is an epidural, which blocks pain during childbirth. In some cases, doctors use sedation along with local or regional anesthesia to make you more relaxed and comfortable, but not totally asleep. This is true nowadays, but wasn’t always the case, Dr. Troianos says. He says anesthesia is safer today because of advances in both technology and medication. Anesthesiologists use a pulse oximeter to ensure that you get enough oxygen during surgery. It helps make sure the breathing tube used for general anesthesia goes into the trachea (windpipe) and not the esophagus — something that was more difficult to determine in the past. Another thing anesthesiologists watch for is malignant hyperthermia. This is a rare reaction that some people have to anesthetic drugs that causes a high fever and can result in complications and even death. Anesthesiologists are now better able to treat this, thanks to better medication, Dr. Troianos says. Although most anesthesia wears off fairly quickly, you may still feel groggy or have impaired judgment after surgery. “We usually tell people not to make any major life decisions or drive a car or operate machinery for the first 24 hours after surgery,” Dr. Troianos says. In the past, people who had an epidural or spinal block had a risk of paralysis because of the anesthetic, Dr. Troianos says. Since bottles are no longer sterilized this way, that risk is gone, he says. Recent movies have used this as a plot point, but it’s exceedingly rare, he says. And anesthesiologists use many strategies to prevent it. “Typically, the patient’s blood pressure and heart rate would go up before they would regain awareness. So we monitor those things to guide the amount of anesthetic that we use,” explains Dr. Troianos. If someone is extremely sick or was in a serious accident, vital signs are less reliable. And those who abuse drugs and alcohol are sometimes less affected by anesthesia than others. In those cases, however, anesthesiologists carefully monitor brain waves to help make sure the patient stays asleep. This allows doctors to adjust the anesthesia to maintain unconsciousness until the procedure is over, Dr. Troianos says.